Took a weekend tour of Ontario’s heartland last week. There are many fun things to see and do just a couple of hours of car‐ride away. We stayed at a bed and breakfast in Hickson. 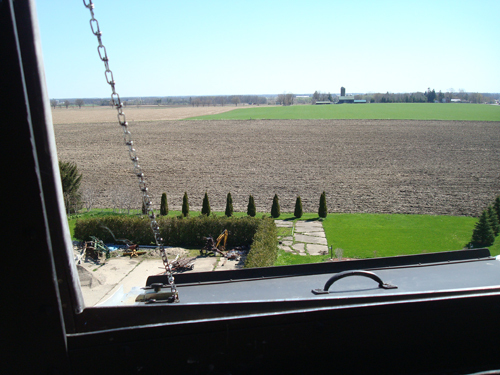 The owners converted the silo on their farm into an observatory. Gerald even gave us a personal tour of the observatory, explaining how it worked and everything. 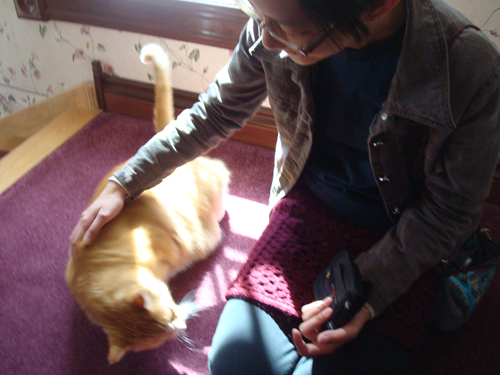 At the b & b also lives a very affectionate cat named Paris. I love this picture of me and Paris. We made a quick stop in Stratford, known for its festival of Shakespearean plays (and now Justin Bieber). There’s a lovely Shakespearean garden, but we were a bit too early in the season to see full blooms. The next day we went to London to visit the Museum of Ontario Archaeology. 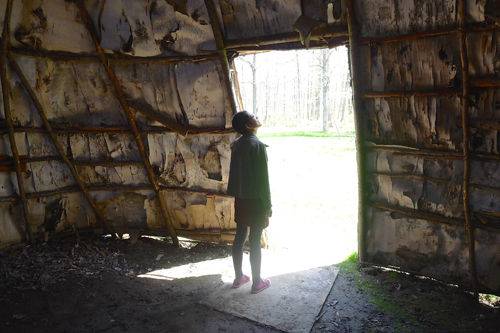 It’s built on the land where an Attawandaron Iroquois village once stood 500 years ago, and so there is a replica of a longhouse, made of tree branches and tree barks. 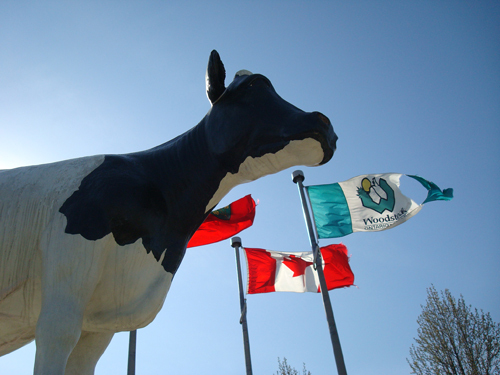 Then we went to Woodstock, the “dairy capital of Canada”, and visited the monument of Springbank Snow Countess, a record‐setting milk producing cow. 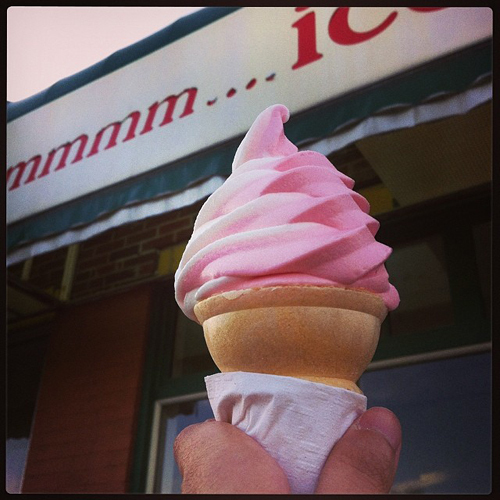 It’s not a road trip without roadside ice cream, especially in the dairy capital of Canada. 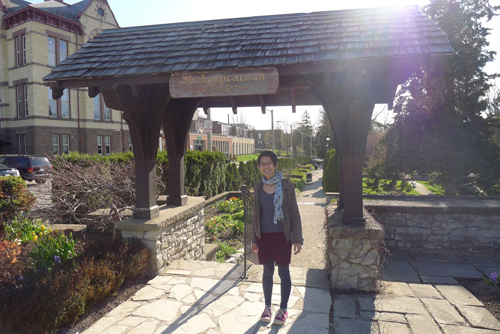 Finally, we visited the Cheese and Agriculture Museum in Ingersoll, with an interesting replica of a cheese factory. 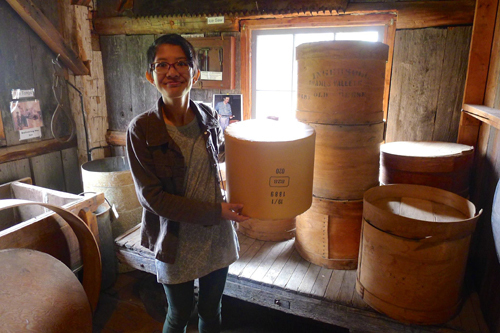 Here I was in the curing room with a replica of finished cheese. There was also a one‐room school house and a display of school supplies. 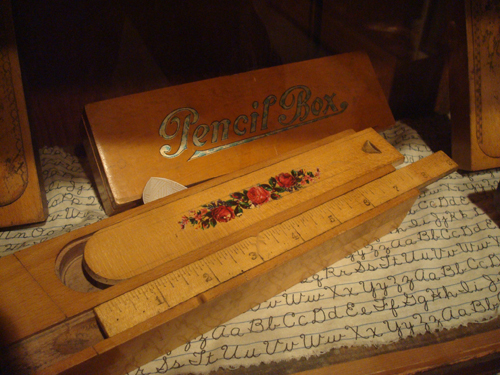 I especially like this pencil box, with a built‐in ruler. I would bring it to school any day. 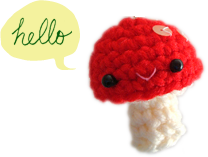 Wishing you a week of delightful adventures near or far! Great photos Trish, looks like a great trip. I had pencil boxes like those when I was in primary school!